The Holiday of Chanukah is enjoyable and fun. 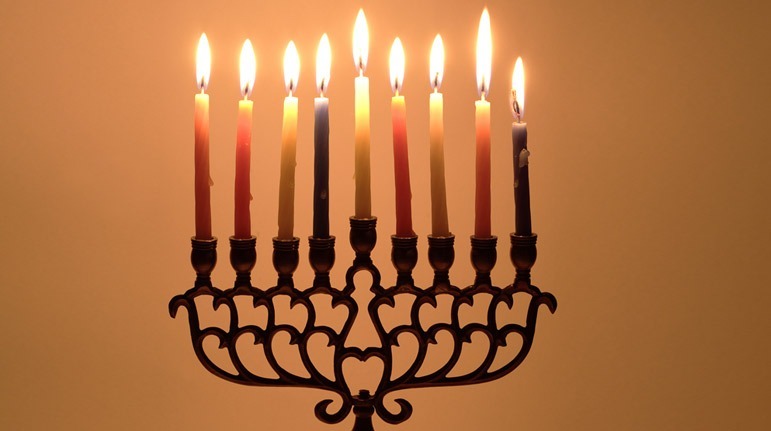 We light the menorah, play dreidel, eat latkes and jelly doughnuts, and give gifts to children. 1) G-D saved us from a mighty superpower and G-D continues to save us, even today. 2) The actions of the Chashmonaim (those Jews who fought the mighty Syrian-Greeks) teach us we must be willing to do battle for Torah. We must also have the courage to risk our lives, if necessary, and be willing to sacrifice for the sake of G-D. We need to show self-sacrifice and the courage to fight against all odds. The question is, if we are cowards by nature, how can we summon our courage to overcome all obstacles and difficulties for the sake of G-D and the Torah? A king, traveling on the side roads, saved a princess (from a different kingdom) from being attacked by bandits. The princess thanked the king very much. Sometime afterward, the king (who was not married) called the princess for a date. She brushed him off, and refused. The king wanted a date, so what did he do? He hired the very same bandits, that originally attacked her, to attack her, again. That provided the king with another opportunity to save the princess a second time (and hopefully get her to agree to go on a date). However, the second time, the princess was not in danger. It was a charade-just like a play. There used to be a TV show called Candid Camera. Funny situations were created to see how people would react. The moderator of the show, Mr. Alan Funt, was once on an airplane that was being hijacked to Cuba. The passengers on the plane were not scared at all-they thought they were on the tv show, to see how they would react. Since they felt it wasn’t truly happening, they were not afraid. This illustrates a very important point. Sometimes, we are faced with great challenges and hardships in our lives. Yet, they are not real! They are “set-up” by G-D to encourage us to react the proper way, encouraging prayer (and more closeness to G-D) and/or spiritual growth. It is as if G-D hired actors to challenge us, hoping we will succeed in overcoming the challenge. If this is true, we don’t need any courage. All we need is an awareness that G-D is the only Power in the World. Every stressful situation, we find ourselves in, is only a test by G-D to see our reaction. There is nothing to fear! At the time of the Chanukah story, the Jews slackened in their service of G-D. G-D sent the Syrian-Greeks to forbid the observance of mitzvos, as a test to see how the Jews would react. Matisyahu and his sons and many other Jews understood that they were being tested and passed the test. They showed their willingness to risk their lives to perform mitzvos and then to fight the Syrian-Greek armies. This awareness, that all that happens to us is only a test from G-D, should give us the courage to conquer any obstacles and difficulties that we face.